Here is a history of Pet milk published in the Northside Journal in Jerome, Idaho. It provides some history of Pet Milk, aka Sego Milk. They also had a plant in Richmond, Utah, which is where my Grandfather, Norwood Jonas worked until it closed about 1967. 1885- It started with an idea of canning as a preservative in the small town of Highland, Illinois. After a $15,000 investment the Helvetia Milk Condensing Company was born (later to be renamed PET). 1895 – After overcoming a number of growing pains, more than half the company’s sales were in the West. The “Our PET” trademark is registered and becomes the official name for the company’s leading brand. 1898 – “Our PET” helps supply Teddy Roosevelt’s Rough Riders and other. American fighting troops with a safe and convenient source of milk in Spanish-American War. At war’s end, the troops scattered home across the U.S. and many, remembering the high quality milk, brought it home to their families. 1914 – Once again, the U.S. government places large orders of PET to supply U.S. troops fighting overseas in World War I. 1929 – In the midst of the Great Depression PET becomes an important staple to American families and is able to expand its service to consumers with the creation of original recipes using PET products. 1941 – Again, PET is called upon to supply GIs fighting in World War II, as well as the citizens at home. More recipes, specifically designed with rationing limitations in mind are created to help families get a wholesome diet. 1950 – the combination of post-war prosperity and a baby boom result in more cans of PET Milk being sold than any other time in company’s 65-year history. PET also establishes its own test kitchens to develop and test new products and recipes. 1966 – PET began making “better for you” products including a Skimmed Milk and a 99% Fat Free Evaporated Skim Milk. Today – PET Evaporated Milk continues to be a staple in millions of homes and is used in many different homes and is used in many different recipes, from main dishes, to soups, desserts and more. We invite you to try the recipes on this site to create sensational food for your family! John Baptist Meyenberg (1847-1914) was an operator at the Anglo-Swiss milk condenser at Cham, Switzerland. Anglo-Swiss made sweetened condensed milk. From 1866 through 1883, Meyenberg experimented with preservation of milk without the use of sugar. He discovered that condensed milk would last longer if heated to 120 C (248 F) in a sealed container, and hence could be preserved without adding sugar. When Anglo-Swiss declined to implement Meyenberg’s work, he resigned from the company and emigrated to the United States. John Meyenbert first moved to St. Louis, but soon transferred to Highland, Illinois , due to its large Swiss population. On 25 November 1884, U.S. Patents 308,421 (Apparatus for Preserving Milk) and 308,422 (Process for Preserving Milk) were issued to Meyenberg. Meyenburg associated with various local merchants, including John Wildi, Louis Latzer, Dr. Knoebel, George Roth and Fred Kaeser and, on February 14, 1885, organized the Helvetia Milk Condensing Company. In 1899, Meyenberg assisted Elbridge Amos Stuart in producing Carnation Evaporated Milk. 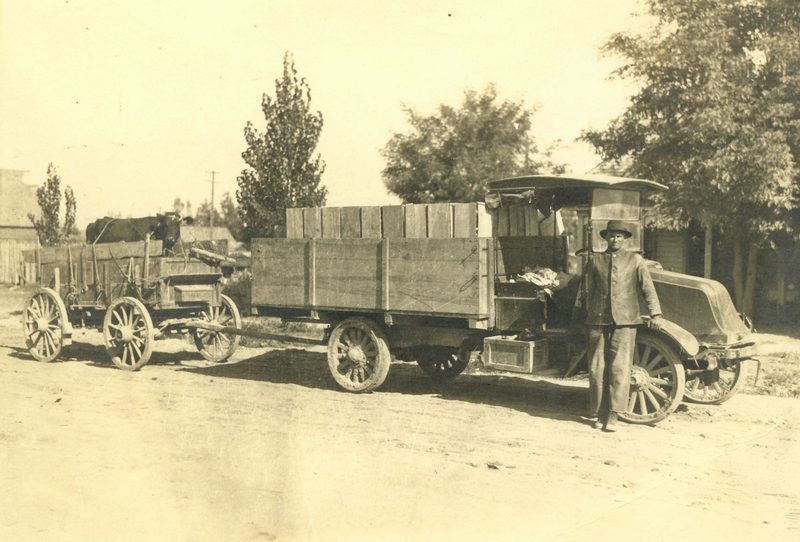 John Wildi was instrumental in marketing the product nationally and internationally, especially in areas where fresh milk or refrigeration were scarce. In 1895, the company registered the Pet trademark. A transaction of importance to the dairymen of Buhl county was consummated on Saturday afternoon of last week when the Sterling Creamery Co of Twin Falls, secured by lease for a period of one year, the plant, business and good will of the Buhl Creamery, Milk Condensing, Cheese Manufacturing company of this city. The consideration was highly satisfactory and most remunerative to the local company, guaranteeing, as it does, a substantial market, paying a liberal consideration for the business and being in effect for a period of only one year. During the Spanish-American and First World wars, the U.S. government ordered huge supplies of evaporated milk, spurring Helvetia to build a second plant in Greenville, Illinois. By 1918 the company had a total of ten production sites in the Midwest, Pennsylvania, and Colorado. As World War I ended, Helvetia closed plants due to oversupply, reluctantly pulling out of western markets. Latzer sold the excess milk to St. Louis businessmen, who turned to him in 1920 when a strike by the local milk producers association limited the brokers’ supplies. The St. Louis strikers also convinced the Highland area farmers to strike, however , and Latzer was forced to close the plant. By early 1921, Latzer’s son John ran Helvetia from its reestablied headquarters in nearby St. Louis. In 1923, Helvetica was renamed Pet Milk Company, after its best-selling evaporated milk brand. Many people are wont to confuse evaporated and condensed milk, but there is no similarity between the two. Condensed milk is a combination of sugar and milk and can be used only when both of these substances are desired. Evaporated milk is with about sixty per cent of the water removed and the nutrients content left intact. Pet evaporated milk manufactured in Buhl, & other locations in the United States at the turn of the century. About 12,000 lb of milk per day is being received at the Sego condenser which when evaporated makes 5760 tall cans. The product is being stored for the present at the plant. The phenomenal increase in dairying in Idaho is vividly set forth by figures just made public by Idaho Chamber of Commerce in its organization publication for June. Evaporated milk production in 1928 was 1,585,000 lbs, a gain of more then 4,000,000 lbs over 1927. J Frank Smith field director and former manager of the Buhl plant, with E G Meyer production manager, have been supervising the overhauling of the machinery preparatory to opening the condensery. Floyd Englen, local manger, stated about 20 persons will be added to the pay roll. The opening of the Buhl plant in addition to furnishing added employment will also serve as an outlet for the West End dairy products. Pet Milk bought Sego Milk Products out of Salt Lake city in 1925, to expand it’s market. Pet Evaporated Milk Peaked in 1950. After World War II Pet Milk began a slight movement into other markets. The company became the first to offer nonfat dry milk, and advance over the powdered milk developed in the 1920s. Sales soared due to the post-war baby boom, making 1950 the all-time-high sales year for Pet Evaporated Milk. Soon thereafter, fresh milk became readily available, however, and sales began a steady decline. Through restructuring, Pet Milk corporate reduced committee numbers, initiated a profit-centered divisional structure, and recruited marketing professionals. The company also planned new product development to wean itself from the declining milk market (as late as 1960, 95 percent of Pet Milk sales were in dairy products). By the early 1960s, diversification had begun in earnest. Another of Pet Milk’s successful products at this time was Sego Liquid Diet Food, introduced in 1961. After competitors had opened up a market, Pet Milk brought in its own version, a thicker, high-protein drink available in variety of flavors. By 1965 Sego brought in $22 million to the company’s Milk Products Division sales. In 1966, in order to reflect its enlarged and diversified product line, Pet Milk changed its name to Pet Incorporated. The bulk of this article is based on TFTN articles. Buhl’s evaporated milk plant – which has provided Magic Valley jobs for 68 years will close June 20. Pillsbury Co executives told 64 workers Thursday morning that they’re shutting the plant which produces evaporated milk as a cost saving measure. That means 300,000 fewer gallons of milk will be passing through Buhl each day. And a plant that each day produced 5000 cases of canned milk will be vacant. Eventually, the plant will be sold. Evaporated milk production will shift to a company cannery in Greeneville, TN. But chances are slim that displaced workers will get to follow their jobs back East. Many of you know I continue to roam the country looking for family photographs. I often whisk a photo album away from an owner for a week or two so I can hopefully preserve the photos digitally. As I do so, often those photo albums contain photos of other families not linked to my own, but linked to the individual who often begrudgingly allowed me to borrow a sacred treasure with a high degree of trust. I borrowed an album from Colleen Coley Todd of Buhl, Twin Falls, Idaho. I have written of her parents, Ivan and Clara Coley and her relationship to me. Found within her photo albums are pictures of her husband, Melvin “Mel” George Todd, and his family. This photo is of Mel’s grandfather AW Todd, Albert W (William?) Todd, born 8 October 1875 in Clarkrange, Fentress, Tennessee and died 27 September 1962 in Walla Walla, Walla Walla, Washington. Click on the picture, I scanned it at a higher resolution. This photo tells us so very much, yet we know so little. That is a cow tied in the trailer, not just tied, but somehow loosely tied down. As if the cow was going to bounce out. A truck with a wagon behind it, extra length tongue. What model is the truck? Did he work for a dairy? The back of the photo has this written, “George Todd, 441 Teton Drive, Jerome, ID 83338, Man by truck is AW Todd.” At least we know that was written after the early 1960s since that was when zip codes were put in place. George Todd is AW’s son. At any rate, a fascinating find. Whether taken in Idaho or Washington, it tells its own story. I can saw that AW Todd lived in Tennessee in 1910 and in Twin Falls County in 1920 and 1930, which is the likely location of the photo. Milo James Ross, 93, peacefully slipped out of mortality in the comfort of his own bed in Plain City on 17 July 2014. Milo was born 4 February 1921 in a log cabin north of Plain City to John “Jack” William Ross and Ethel (Sharp) Ross. His mother tragically died from childbirth in 1925. Milo and his siblings lived with his Ross grandparents until the costs proved too great and his Uncle Edward Sharp raised Milo in Plain City until adulthood. He grew up tending to his Grandmother Sharp and spending most of his time farming with his many Sharp cousins and his siblings. He attended schools in Plain City and graduated from Weber High in 1939. Milo met Gladys Maxine Donaldson at a Plain City celebration in 1940. They would meet from time to time for dancing at the Berthana in Ogden. Milo and Gladys married 4 April 1942 in her parent’s home on 8th Street in Ogden. Milo enlisted in the Army in October 1942. He served in the 33rd Infantry Division, 130th Regiment, Company C. He trained in weapons and earned his expert ranking. 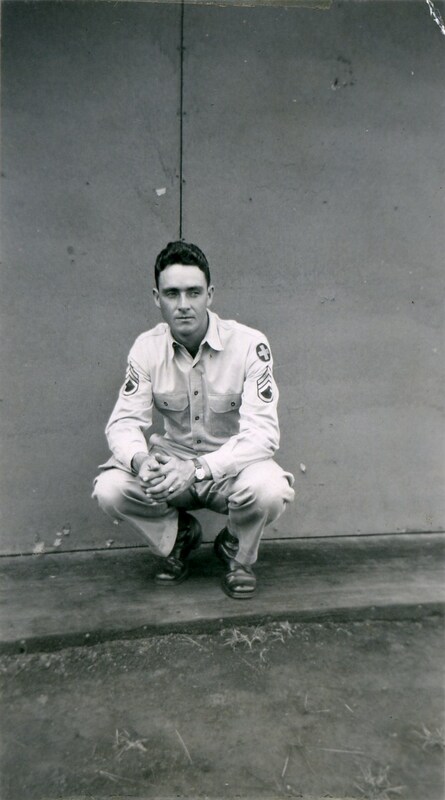 He arrived in Hawaii in July 1943 and received the announcement that his son, Milo Paul, had been born. He served as part of the Philippine invasion force and they fought through the jungles and liberated Baguio City. He was injured five times, one while tending to other soldiers awaiting medical attention. He was present at the Japanese surrender at Luzon as a Technical Sergeant in June 1945. 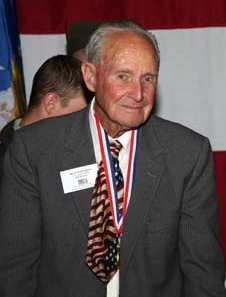 He received two purple hearts and the Silver Star for his service at the end of World War II. His Company received a Presidential Citation for outstanding performance during armed conflict with the enemy in efforts to seize Hill X in Bilbil Mountain Province. At the time of Milo’s death, the military was preparing to award him another Purple Heart, another Silver Star, Bronze Star, Good Conduct Medal, Asiatic-Pacific Campaign Medal & Bronze Star, World War II Victory Medal, Combat Infantry Badge 1st Award, Philippine Liberation Ribbon and Bronze Star, Honorable Service Button for World War II. He was also to be awarded the Philippine Liberation Medal and Republic of the Philippines Presidential Unit Citation Badge from the Philippine Government. He returned home in 1945 and began working with his father-in-law. He eventually began building or remodeling homes. He estimated he had built over 120 homes and remodeled another 50 homes or buildings in his lifetime. Two more children joined Milo and Gladys in 1946 and 1948, Judy Ethel and Caroline. Milo and Gladys dedicated their lives to raising their three children and tenderly caring for Judy’s needs until she passed away in 1998. Milo and Gladys solemnized their marriage 2 July 1976 in the Ogden LDS Temple with their daughter Judy by their side. Milo served in various callings as a humble servant favoring their time as temple workers in the Ogden Temple for almost a decade. Milo and Gladys also relished their time in raising their garden and providing its fruits to friends, family, the temple, and local hospitals. Milo is survived by his son Milo (Janice) Ross of Hazelton, Idaho and daughter Caroline (Abram) Gallegos of Plain City. Eight grandchildren, Scott (Robyn) Ross of Kimberly, Idaho; Jeffrey (Holly) Ross of Jerome, Idaho; Becky (Joseph) Patterson of Portland, Oregon; Paul (Amanda) Ross of Burley, Idaho; Andra Ross of Heyburn, Idaho; Christy (Sterling) Neilson of Rupert, Idaho; Cindy (Steve) Pease of Albion, Idaho; and Lonny (Amy) Taylor of Declo, Idaho; seventeen great grandchildren; and eleven great great grandchildren. Milo was preceded in death by his parents; his wife Gladys; all five siblings Hobart Day, June Stout, Paul Ross, Harold Ross, and Earnest Ross; daughter Judy Ross; grandson-in-law Bret Adams, and two great grandchildren. The funeral will be held Tuesday 22 July 2014 at the Plain City 7th Ward Building, 2952 N 4200 W, a building he helped organize its construction, at 11:00 AM with Bishop Tom Matthews officiating. Friends may call at Lindquist Mortuary in North Ogden at 2140 N 400 E (Washington Blvd) from 6 until 8 PM on Monday 21 July 2014. Friends may also call from 10:00 until 10:45 AM prior to the service at the church. Burial will be in the Plain City Cemetery beside his beloved Gladys and Judy. Another crazy weekend. However, I am proud to announce I received 8 hours of sleep on Sunday! It was the first time in what must have been months. I woke up with a hang over though from something. Perhaps the body was not used to having so much rest. Who knows. Made my way down to Richmond again on Friday night. I took Erika to Twin Falls this time, rather than dropping her at Jerome or Burley. I stopped in Logan to pick up some books I ordered online. The autobiography of Burton K Wheeler and Huey P Long, also a biography of Frank Church. I am looking forward to reading them, although the one stenches of BO. Amanda was able to come up and meet me in Logan so we went out for some World Famous Aggie Ice Cream. The line proved that there were plenty of people desiring ice cream that late at night. It must have been 9:30 and the place was crammed full of people. Then to top it off, this lady stood and chatted with everyone at the cash register. I had partially eaten my toffee crunch ice cream cone before she finally departed the store. If somebody wants to get rich, they should invent an ice cream scoop that puts the ice cream clear to the bottom of the cone. Unless of course, you like your cooled air inside the cone, slightly condensed with diary moisture. Out to Richmond, moved in for the nocturnal visit, and spent some quality time together. The Lundgreen’s had already gone to bed! I had to get to bed early so that I could rise and be ready for Brad to arrive at 6:15 for work. It seems I didn’t even fall to sleep the night went by so quickly and the alarm clock was off. Up, breakfast, and off we go to Preston. Sprayed lawns in Malad again. A great day. Visited St Johns, Pleasantview, and Malad in our spraying adventures. This lady up on the hill had a cool horse drawn buggy in her garage. We sat and visited with her about Grass Valley, California for a while. It was pretty interesting. Now, I have to tell one of the highlights of the day. Lunch at the Dude Ranch Restaurant, Main Street, Malad, Idaho. By the look of things, it looked a bit dingy and run down, but good friendly hospitality Brad and I took our seat in a booth which was probably one of the originals from 1945. Definitely enjoyed the old bottle bottom glass separating the booths, which seems to have faded since the 70’s. We ordered a bacon cheese burger and I added a nice pineapple shake to my order. I had to get my fruit somehow and didn’t think the potatoes in the fries counted other than as a vegetable! They hand cut their fries. I had a curly fry that when I picked it up must have stretched out over a foot in length! Oh, they were delicious. The burger, home made patty, with everything freshly cut was so good. Oh yes, I have a new favorite in dining. Too bad it is so far off of my normal routes of travel. Eddies in Smithfield, Utah has some pretty darn good fries too! Not to mention their Bar-b-Que. Anyhow, Brad and I departed happy individuals from a good down home meal. Sometimes I get so darn tired of the other foods. Made our way back to Preston discussing the problems of the world. Faith, diligence, and decision making in our lives. We discussed politics, Supreme Court, Presidential Appointment, Idaho, Franklin County, Utah, and the role of law. It was interesting. We discussed other things, but due to my age, have now slipped from memory. In Richmond, I completed my online class, visited with the family for a bit, and headed out for the Jonas family reunion in small Mantua, Utah. Pulled in, drove around in circles at the Fish Haven Campground, and finally settled the car on a nice piece of grass. Thought to myself, “Self, visit a few, catch up, get some e-mails, and get the heck out of dodge.” Well, I appeared and various people came up and said hi and next thing I knew everyone was asking about Amanda and the rest of the year. I never knew I was in the loop with the Jonas clan. I thought I was descendant of a long dead brother whose family had fallen from the planet. Trying to gain some information and knowledge of the family had been difficult in the past. Now somehow, I was the center of attention and did not even come prepared. Well, I went and located my car (it was not where I swear I had just parked it!) and pulled out my computer. Sat down at the picnic table and started showing photos of the beloved Amanda. After two pictures, I caught them all by surprise by moving it to the Jonas and Coley pictures. Yep, had them then within my grasp. They were chatting and talking about old times. Laughing and identifying people in the pictures which I had given up hope on finding out who they were. After a good half hour of changing the subject from me to the Jonas pictures, I opened Personal Ancestral File and started showing what I had. They oohed and awed and started lining up to make sure I had the information correct, and gave me more. Well, by the end of my 4 hour stint, I had gathered the contact information for 8 separate families, and loaded into PAF 6 entire new families! I was pretty excited. So over the next months, via e-mail, those names and families will be fleshed out with dates and places. It turned out to be more productive than I though. I had thought the Jonas family was not interested in their genealogy and I was a lone sentinel trying to amass information. Alas, they are already lining up for me to put together a book and have it at the family reunion next year. The best part, the bond increased amongst us and for once, I felt a part of the extended Jonas Clan. The moment arrived when I had to depart from Mantua. Off to Tremonton, I met Brad Hales again and we headed up to the Kasota home of the Ross’. We crashed the night there and Sunday morning arose for our final leg to Nampa. Brad was kind enough to prepare me a bowl of rolled oats. I love rolled oats, don’t get me wrong, but the amount of so much I could not place any milk into my already oversized bowl was a bit much. I felt like I had eaten too much afterwards. The honey in it was really good though! Hey, I lowered my cholesterol today! We then made the trek to Nampa, and then Kuna, Idaho. On the route, we discussed Brigham Young, being led and inspired of heaven, recognizing that guidance, and Oliver Cowdery. Interspersed with our personal adventures, experiences, and stories. It was interesting. Parma, Idaho was an experience finding. I thought it was just one of the next towns from Nampa. Nope. A few miles to Caldwell, then to Notus, then to Parma. It was like 30+ miles. Oh well, it was a beautiful Sunday drive. I was tempted just to go to Nyssa, Oregon too, but decided against it later. I found Parma, and took a stroll around the Roswell and Parma cemeteries for the Ross Clan. I don’t have a direct link to them, probably don’t but feel so compelled to assemble their family history. Hopefully the future will reveal why. I found 4 in Roswell, and 10 in Parma, including Charles Benjamin Ross. That I was excited about. Took a good drive around the area. They must be raising something like grapes or something. I have never seen the vines growing like that. The Roswell Cemetery was surrounded by them. There were also plenty of onion fields. I swear I could smell spearmint too, but never got out to go into the fields to see if I could find a field of spearmint. I also never realized Parma was the home of Parma farming implement. Learn something new every day! Headed back to Eagle, and crashed for the rest of the afternoon. Did some catching up on the family history from Mantua, and visited on the phone. On a sad note, I found out my 3rd Grade teacher, Ella Suhr passed away in June. I was hoping to at least write her and say thank you for the influence she had on my life. I suppose I will have to wait a while now. Well, I will close. Hope it was not too long and tedious of an entry. It was a fascinating weekend, even though I am exhausted. The usual state I am in as of late. It is all worth it though. I only hope my body will endure it for a very long time. Well, here is a beginning of the life of Paul Ross online. I grew up in Paul, Idaho. My home is in an area known as Kasota, which is part of the larger area of Emerson, which is encompassed by Paul. Actually, Kasota sits on the county line, so technically I fall under Hazelton. Paul phone number, Hazelton mailing address, Minidoka School District, but Jerome for voting and jury. Just a mess. I hope people will find that I will post some interesting bits every once and a while. I will do this for the benefit of others, not for myself. For those who wish to follow my life as I go through the adventures of life. Please feel free to e-mail me with questions or anything else.